The heavy duty construction of the EMW® slurry pump is built to last and features components with double the thickness of comparable medium duty slurry pumps. The type of design, combined with MAXALLOY® 5A hard iron, creates the ideal slurry pump for high wear applications. Wilfley used the latest computational fluid dynamics software to determine the optimal balance between hydraulic performance and wear life and then validated the design with extensive empirical testing in the field. 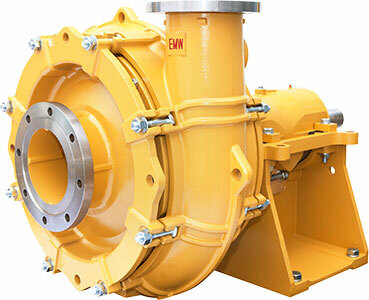 The heavy duty construction of the EMW® slurry pump is built to last and features components with double the thickness of comparable medium duty slurry pumps. The type of design, combined with robust elastomer liners, creates the ideal slurry pump for high wear applications.